Young parents, preparing a first aid kit for a newborn baby should put it in a nasal aspirator. It will help to remove from the baby's nose mucus, secrets of the nasal passages, crust, formed due to dry air. If nasal congestion baby refuses the breast, restless sleep and cries often. The kid can't vysmarkivatsya, and the use of vasoconstrictive drops in infants is prohibited. Come to the aid of children's aspirator, which by creating negative pressure suctions the mucus from the nose and clears the nasal passages. Before using a nasal aspirator should read the instructions and put the child physiological solution, this will need a pipette. Sprays and irrigation of the sinuses for newborn children prohibited! Instead of saline, you can apply "Akvamaris", "Marimer", "saline", decoction of sage and chamomile, but to appoint these funds can only be a doctor. The baby had breathing difficulties during the procedure, it should be kept in a vertical position. After using the saline solution you must wait 20-30 seconds, then gently insert the tip of aspirator into one nostril, and close the second finger to form a vacuum space. In order not to cause the child pain, pear release slowly. You must then remove the aspirator from the nose and squeeze from him the slime, wipe or wash the apparatus and repeat the procedure with the other nostril. Pediatricians suggest using a nasal aspirator not more than 2 times a day, not to overdry the mucous membranes. If a child scares the aspirator, the fixture can be replaced with a swab. Initially spoil saline, roll the wool in flagella and clean their nostrils. 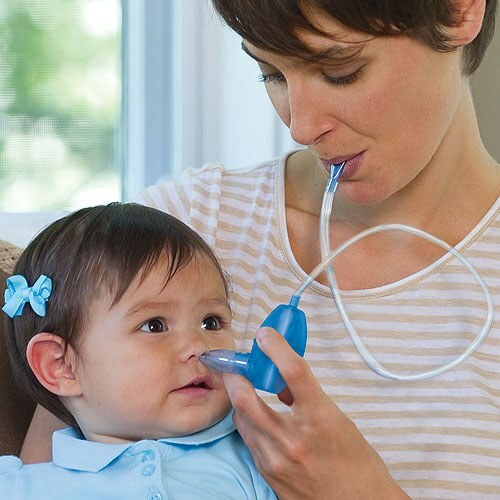 This method is not as effective as baby aspirator, but it can ease the child's condition. If you follow all the rules for the use of the aspirator, the risk of injury can be minimized. But that the procedure was absolutely safe for a child, parents must be mindful of the precautions. During the procedure, you need to constantly monitor the position of the tip of the aspirator, so as not to injure them mucous membranes of the nose. Even with a little bleeding cleansing must stop, tilt the child's head forward and gently press the wing of the nose to the bulkhead. If the runny or stuffy nose appeared at the newborn baby, you should immediately contact your pediatrician. Nasal aspirator relieves child, but not struggling with the disease.